RodPrjónar: Two hats / Some WIPs / Winter is here! / Cozy weekend. 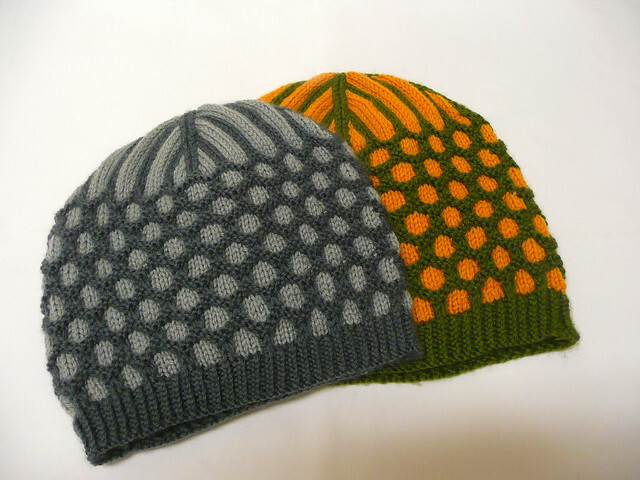 Two hats / Some WIPs / Winter is here! / Cozy weekend. It has been quite a while since my last post here. These last couple of weeks have been somehow very strange. I guess it is always like that when the end of the year starts to approach. December is always a busy month: Reunions with friends, family and coworkers, Christmas (of course), several birthdays (including mine! Which I personally find really boring because everybody is thinking about something else! 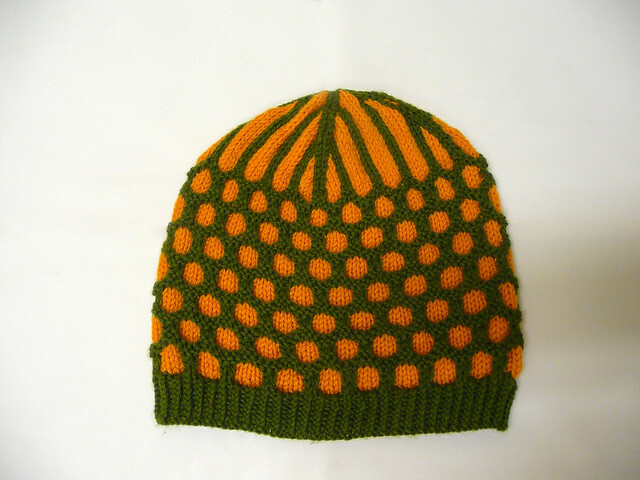 What I have managed to finish this far is two hats. This one is for a friend who lives in Germany. He saw the pics of the hat I made for J.B. and asked me if I could make one for him as well. This one is for the daughter of a friend. I wanted to play it safe in this one and let the girl choose the colors. I think that the colors she chose are really interesting considering that she is around 10 years old. It is not very clear in the picture but the darker color is not just gray it is a blue-greyish color. Very pretty. * They are basically the same as the hat for J.B. 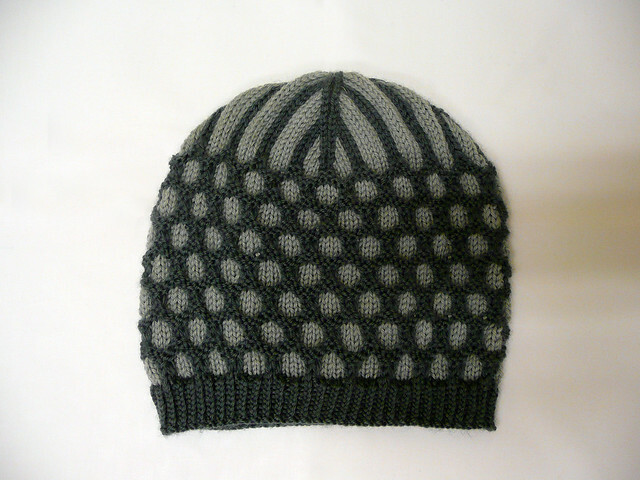 Except for the the fact that I used smaller needles to knit the gray hat. I used 2.5mm for the ribbing and 3.0mm for the rest of the hat (instead of 3.0 and 3.75mm). * I used the german cast on again in both hats. I think I am becoming a HUGE fan of german cast on. It looks very nice and most importantly it is VERY elastic and durable. I HIGHLY recommend it. And the best of all is that it is not difficult to make! * I must say it again: I love this pattern! Knitting it is really fun and quick and the result is always pretty. Besides it is really cool to play with color combinations. So, talking about my queue... 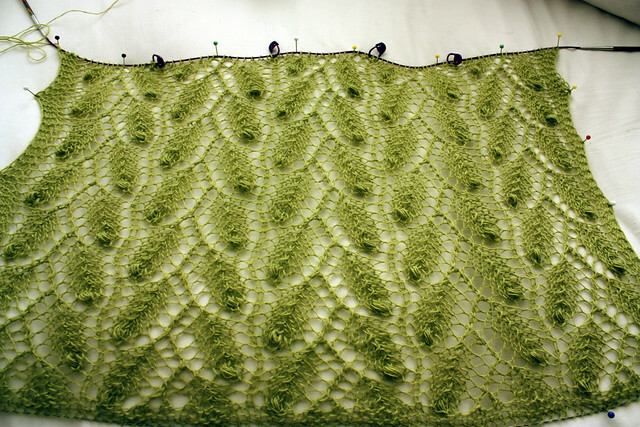 I still have two unfinished shawls: leaves and nupps (in the picture) and an Echo flower (that I have barely began... I think I have just made 4 repeats of the first chart this far and no pics yet). * Ermar. It is for a friend (actually the mother of the blue-gray hat girl). This is a pattern that I have already knitted before. It is very simple and quick to knit. I made this one about two years ago for my friend Dyah. Now, talking about something else... WINTER IS HERE!! Finally! After a rather warm winter at the end of last week the weather completely changed and it started to snow! It has been really cold since last friday and everything is just beautifully covered by snow! This was just perfect because we spent the weekend in a summer house in a place that is about one and a half hour away from Reykjavík. It was very cozy!! So all we did was to knit, do some cross stitch, eat good, spend a lot of time in the hot tub while the snow was falling on our heads and took some cool walks. Just walking around... trying to find the river. It was really cold and light was just wonderful. We found an invisible (and apparently naked) man! 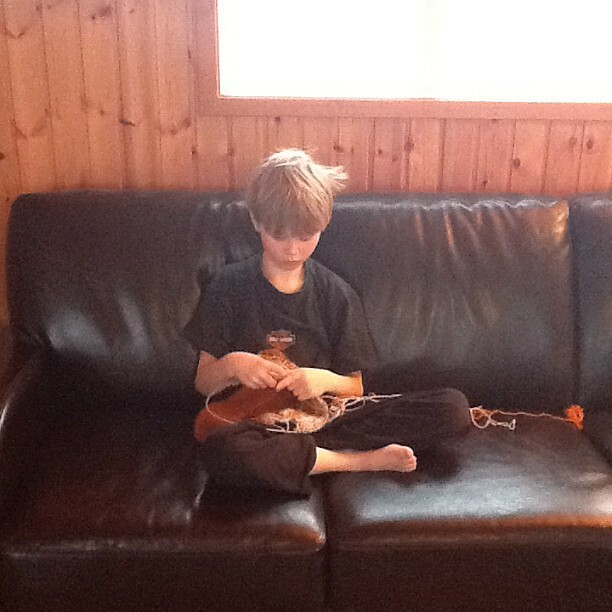 And to finish: A picture of Valgarð knitting... so you can see we were all in the knitting mood during the weekend! Tus trabajos son impecables.Que bella las fotos de tu paseo en la nieve. Todo hermosísimo, los tejidos y las fotos también. ¡Me encantaron los caballos pachoncitos y el hombre invisible!! lucky you to have snow! we have the strangest mild november this year.. the green shawl looks beautiful! Que perfección impecable amigo!!! Intentare tejerle un gorro igual a mi esposito tienes los gráfico, para mi es + fácil tejer con gráfico??? Y pasando a otro tema, esos gorros te quedaron muy lindos! Aparte se ve que son muy calientitos. Muchas gracias por las fotos, esos paisajes se ven increíbles, y los caballos se ven abrazables! Özer: Gracias por visitarme! Los caballos pochoncitos, jeje. Sí, son más bien pequenos y se ponen bien peludos en invierno... como dijo Marhta son súper abrazables! I like to use both German actor hat again. I think I became a huge fan of the German vote. It looks very nice, most importantly, it is very flexible and durable. I highly recommend it. All the best, it is easy to make! Que extraordinario pais, sin duda uno de los mejores viajes de mi vida. Lástima sin embargo, que en aquel momento no estuviera enganchada al punto y no conociera vuestra "lopi". Me encanta la combinación de colores, el punto impecable. Preciosas fotografías con la nieve. Pero la que más me gusta es "Knitting a scarf :)"
ya tenemos otra generación haciendo punto, dile que le envío un beso volando. Brrrrr, es que veo la nieve y me dan ganas de quedarme en casa con la mantita, una buena peli en la TV, mis manualidades y si se tercia, para merendar "chocolate con churros". En el norte de Burgos, todavía no ha llegado el invierno y estamos disfrutando de un otoño muy cálido. Este año no hemos recogido setas ya que desde el verano apenas ha llovido. Me gustan mucho los gorros. You live in such an amazing part of the world. Those shots of the snow are so gorgeous! I have both knitting envy and summer house envy! Lovely winter photos, we're still waiting for snow in Finland. I'm so glad you like the Mesi-pattern! Your hats are beautiful, love the color combinations. Those hats are beautiful! I cant get over them. paso a desearte un feliz año nuevo!! espero que esté todo bien! ¿Dónde estás? ¿Chile? ¿un monasterio budhista? ¿un encuentro de tejido varonil? ¡Vaya chico, que nos has dejado chiflando en la loma! Te extrañamos y esperamos con ansia tu retorno. Espero que tú y tus seres queridos estén bien. Where are you? Chile? A Buddhist monastery? A men's knitting retreat? C'mon Rod! you left us high and dry,we miss you, and we wait anxiously your return. I hope you and your loved ones are doing well. Te acavo de encontrar y me ha encantado lo que tejes. Me copio algunas cosillas, con tu parmiso claro jeje.